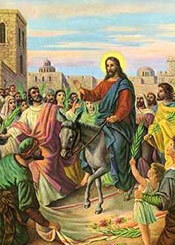 “Palm Sunday of the Lord’s Passion” begins Holy Week. If you have never really experienced all of the services of Holy Week, consider doing so this year. Commemorating the events of the Lord’s Suffering and Death help us to have a greater understanding of the importance of the Easter Resurrection. Jesus had to suffer and die before he rose. On Holy Thursday we will celebrate the Mass of the Lord’s Supper at 7:00pm, which commemorates the night when Jesus instituted the Holy Eucharist and washed his Apostle’s feet. This Mass begins the Sacred Triduum, and at the conclusion of the Mass, the Eucharist is removed from the center Tabernacle in the church and “reposed” in another altar to recall Jesus’ being arrested and jailed. There will be Adoration at the Altar of Repose from the end of Mass until the sun rises on Good Friday at 6:00am. 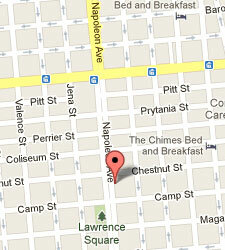 On Good Friday the church will be open at 7:00am for those who are walking to visit the nine churches. Also open will be St. Henry Church and Our Lady of Good Counsel Church. Later on Good Friday, the Veneration of the Cross will take place at 3:00pm, the hour of Our Lord’s death. Holy Saturday is a day of great stillness, as we remember when Christ died and descended into Hell. That great stillness is broken by the joy of the Easter Vigil Mass at 8:00pm, when we gloriously proclaim the Resurrection of Our Lord. The Easter Vigil which will be preceded by Confessions beginning at 6:30pm. 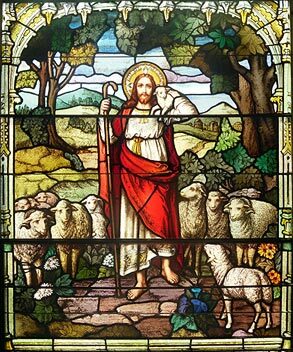 There will be no 4:00pm vigil Mass, and Masses on Easter Sunday will be as usual at 8:00am and 10:30am. This weekend there is a sign-up sheet at the back of church for those who will respond to the plea of Jesus “to stay awake with me one hour” (Mt. 26:40) on Holy Thursday. It is one of the most solemn nights of the year to contemplate Jesus in the Garden of Gethsemane as he prepares for his Passion and Death. Please consider taking one of the hours on the sign-up sheet for our Holy Thursday Vigil. And please consider attending all of the events of Holy Week, which is the most important week of the year for all Catholics. Parish School of Religion/C.C.D. begins on Sunday, September 23 at 9:20 A.M. Classes last from 9:20 A.M. to 10:20 A.M. Please register your child early. Confirmation program will begin on November 4. Classes meet immediately after the 10:30 A.M. Mass, and last for about 90 minutes. Rite of Christian Initiation for Adults (R.C.I.A.) will begin on Wednesday, September 5 at 7:00 P.M. and lasts till 8:15 P.M. Adult Bible Study/Religious Education program for the Fall will be “Miracles” by our D.R.E. Phillip Bellini. The classes will begin on Thursday, October 11th at 7:00 P.M.
Joseph Sibbel was born June 7, 1850, in Germany and emigrated to America in 1871, settling first in Ohio and then moving to New York City in 1881. 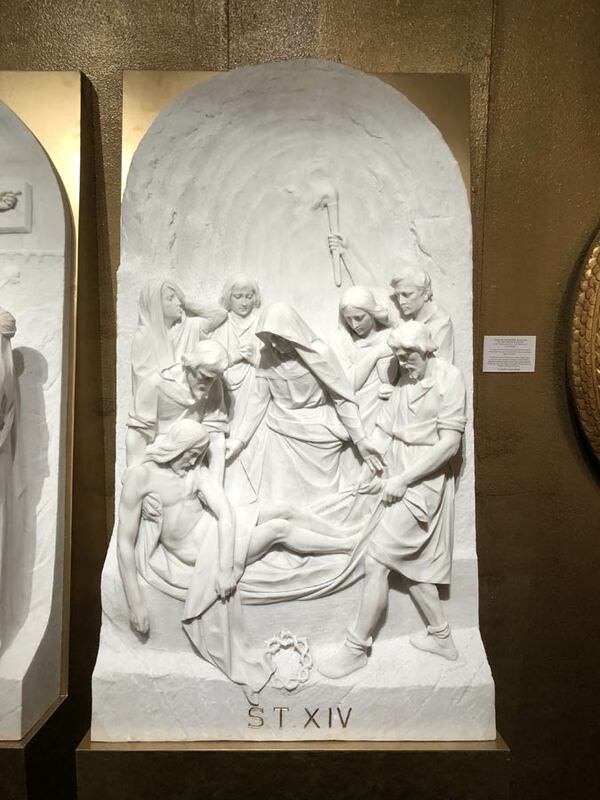 He was often employed by architect Patrick Charles Keely (1816-1896) to work on a number of marble sculptures, altars, and Stations of the Cross plaques for Keely-designed churches. 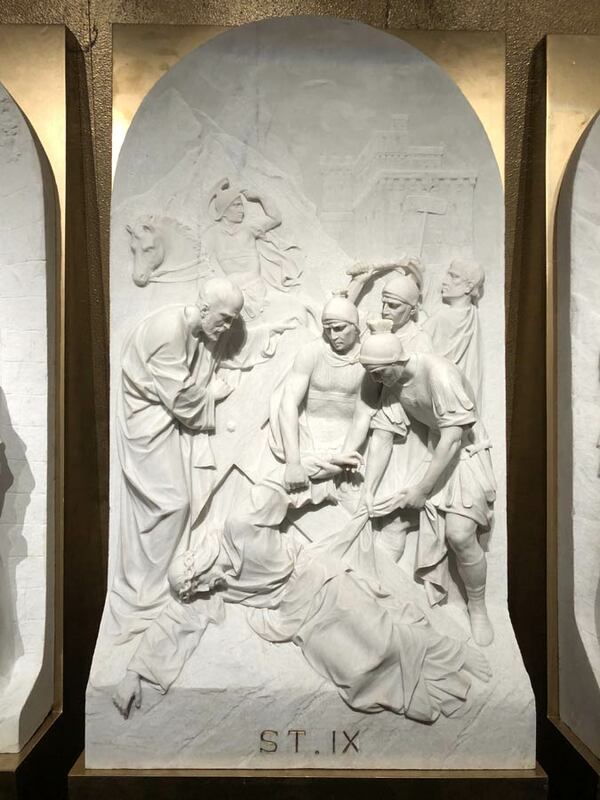 Arguably his most important commission was creating numerous sculptures for St. Patrick’s Cathedral in New York. 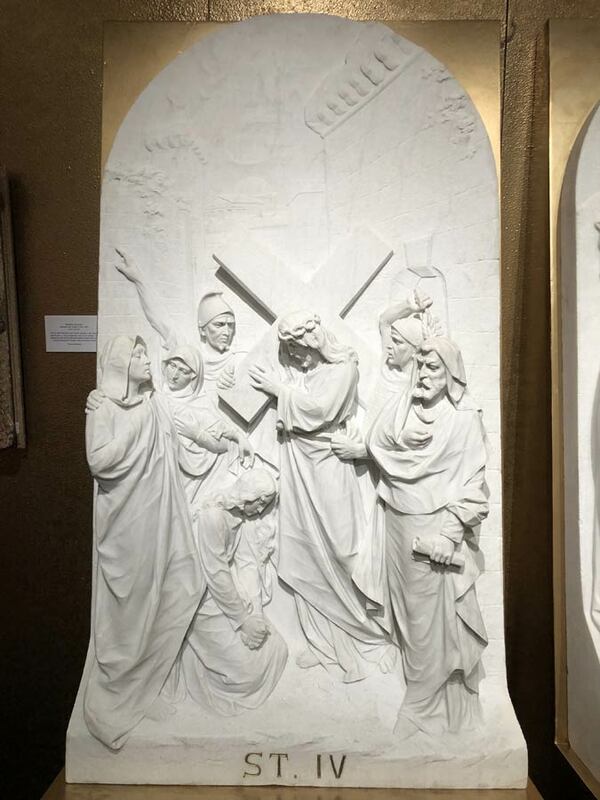 Most often Sibbel’s Stations of the Cross plaques were carved from plaster, but he did execute a handful in marble. 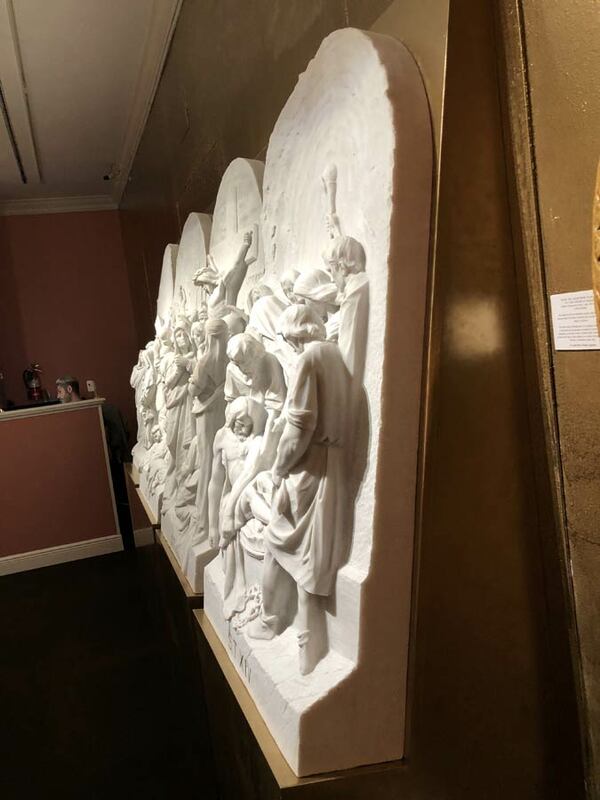 In Amesbury, Massachusetts, St. Joseph’s Church (dedicated in 1876), an Italian marble altar as well as polychrome decorated plaster Stations of the Cross were executed by Joseph Sibbel and installed in the main church in June 1892. Sibbel died on July 10, 1907, and is buried in Woodlawn Cemetery, New York. Sibbel purportedly wished to have all of his models and all of his works in his workshop destroyed after his passing, however, the head of his studio worked with the artist’s wife to gain permission and ensure the continuation of the studio 50 years after Sibbel’s death. At the Mass of the Lord’s Supper on Holy Thursday (7:00 p.m.) sufficient hosts are consecrated for that Mass and for the next day. These consecrated Hosts remain in a ciborium on the corporal in the center of the altar until the end of Mass, after which they are carried in Solemn Procession to the Altar of Repose, with the priest vested in a Cope and Humeral Veil, and covered with a canopy. The Blessed Sacrament remains in the temporary tabernacle at the Altar of Repose, and the Holy Thursday service concludes with the stripping of all altars except the Altar of Repose. Holy Thursday is a day of exceptional devotion to the Blessed Sacrament, and the repository is the center of the love, prayers and aspirations of the faithful. 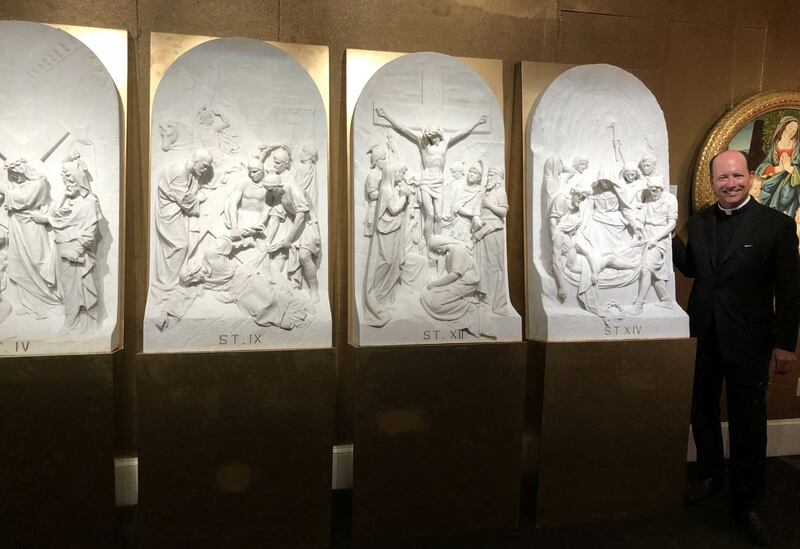 After the Good Friday service, the Blessed Sacrament remains available only as viaticum for the dying and for Communion given on Good Friday at the service called The Veneration of the Cross (Good Friday at 3:00pm). While the Blessed Sacrament remains in this temporary tabernacle at the altar of repose, a lamp or candle is always kept burning. On Holy Thursday we will celebrate the Mass of the Lord’s Supper at 7:00 p.m., which commemorates the institution of the Holy Eucharist when Jesus washed his Apostle’s feet. This Mass begins the Sacred Triduum. 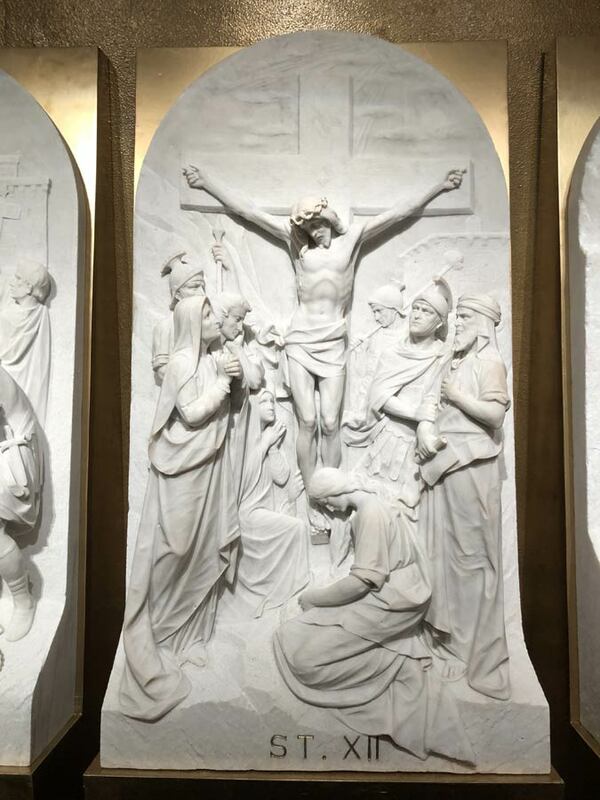 This year Adoration at this Altar of Repose will take place all night, from the end of the Holy Thursday Mass until the sun rises on Good Friday at 6:00 a.m. PLEASE SIGN-UP to take an hour or a half-hour of the Vigil! Sign-up sheets are in the back of church. During Lent there will be Stations of the Cross and Confession on Fridays at St. Henry Church. Confession begins at 5:30pm and the Stations at 6:00pm. Remember that Msgr. Nalty is also in the Confessional from 3:00-3:45pm on Saturdays and 9:15-10:15 a.m. on Sundays. meals are permitted if necessary to maintain strength according to each one’s needs, but eating solid foods between meals is not permitted. Abstinence from meat is to be observed by all Catholics 14 years or older on Ash Wednesday, Good Friday and on all Fridays of Lent. The determination of certain days as obligatory days of penance should not be understood as limiting the occasions for Christian penance. 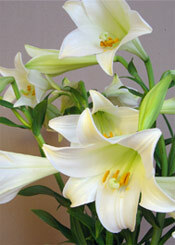 The Spirit of the season of Lent should be maintained throughout the weeks of Lent. The obligation to observe penitential days of the Church is a very important part of our spiritual life. Individual circumstances must be taken into account, but in general, people should seek to do more rather than less, since fast and abstinence on the days prescribed should be considered a minimal response to the Lord’s call to penance and conversion of life. Sunday, February 3 is the Feast of St. Blase, Bishop and Martyr, although it is not celebrated because it falls on a Sunday. St. Blaise, the bishop of Sebaste in Armenia was martyred in the year 316. The oldest accounts tell us that Blaise was a physician at Sebaste before he was made bishop. In the 4th century persecution of Licinius, St. Blaise was taken prisoner. After suffering various forms of torture he was beheaded. The most popular story attributed to St. Blaise occurred while he was in prison, when he cured a young a boy who was in danger of choking to death because of a fishbone in his throat. That story, and the fact that St. Blaise was a doctor, made the saint very popular for intercessory prayer for throat ailments. At an early date, the veneration of this Eastern saint was brought into Europe, and Blaise became one of the most popular saints of the Middle Ages. Numberless churches and altars were dedicated to him. A request from Deacon Richard Eason: “The parish provides a meal service for the homeless at the Rebuild Center on the 1st and 3rd Thursday of each month, and at the Ozanam Inn on the 4th Thursday of each month. This is a great opportunity to serve Our Lord’s neediest people and enjoy fellowship with our parishioners. The next meal service is set for March 3rd. For those interested, the meal is cooked in the kitchen of the rectory of Our Lady of Good Counsel, beginning at noon on the day before. The meal service is provided at the Please contact Dorothy ‘Dottie’ Forly,” at 242-1919. It was a common custom in many lands of the ancient Middle East to cover in some way the path of someone thought worthy of the highest honor. In 2 Kings 9:13 Jehu, son of Jehoshaphat, was treated to this honor. Each of the four Gospels report that the people of Jerusalem gave Jesus the honor of walking on a covered path. However, in the synoptic Gospels (Matthew, Mark and Luke) we hear that the people lay their garments and cut rushes to place on the street. Only the Gospel of John specifically mentions palms. So what is the significance of the palm? The palm branch was a symbol of triumph and of victory in Jewish tradition, and is treated as such in other parts of the Bible (e.g. Leviticus 23:40 and Revelation 7:9). Based on this significance, the scene of the crowd greeting Jesus by waving palms and carpeting his path has given the Christian celebration its name. It shows the freedom desired by the Jews, and their desperation to have political freedom. In fact, they were welcoming their “Messiah,” whom they expected to be a great king who would free them from the oppression of foreign rulers. The entry of Jesus into Jerusalem included chants from Psalm 118 and 148:1. The Hebrew hoshiiah na’ (I beseech you, save now) was changed in Greek to hosanna, which became a famous Christian term, and had a huge Messianic significance. The palm is a symbol of victory for us as Christians. Since we recognize that Jesus is the Messiah (a word which we normally use in the Greek translation – “Christ”), we recognize that He has already achieved a victory for us. But the victory is not over earthly rulers. It’s much bigger. It’s victory over Satan. It’s a victory over sin and death. It’s a victory that gives us Eternal Life. 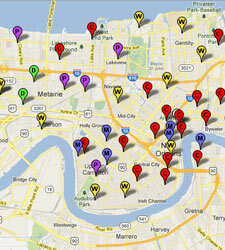 A traditional New Orleans devotion takes place on Good Friday next week. The “nine church walk” calls for pilgrims to walk from church to church, stopping briefly in each of nine churches, to pray and meditate on the passion of Christ. 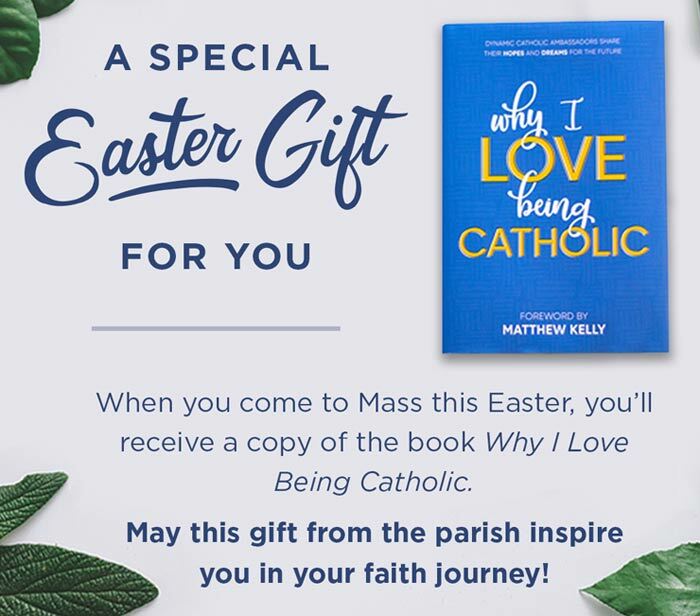 In other parts of the world, particularly in cities like Rome where churches are densely congregated, Catholics visit churches on Holy Thursday, rather than Good Friday. Traditionally, nine signifies the nine days of a novena. A wonderful novena to begin on Good Friday is the Novena for Divine Mercy, which continues until Divine Mercy Sunday. Many pilgrims begin the nine church walk at St. Stephen Church as early as 7:00 am. They will arrive in family groups, parish communities and youth groups. St. Stephen Church, St. Henry Church and Our Lady of Good Counsel will be open from 7:00 am until noon on Good Friday. If you can help greet pilgrims and distribute water at either St. Stephen, St. Henry or Our Lady of Good Counsel, please contact the parish office at 899-1378, or just show up! What Is BEST LENT EVER? Come and support the KC’s and Good Shepherd Parish at a fish fry. 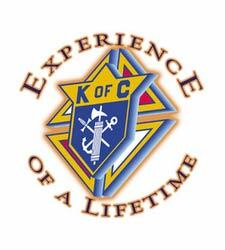 Knights of Columbus will be hosting the Lenten Fish Fry every Friday during Lent starting March 8th through April 12th at the Mother Pauline Center after the 6pm Stations of the Cross in St. Stephens Church. March 8th Stations will be at St Henrys.